I saw this on a wall and couldn't resist. Click here for a different and more complete picture of the sign. Is it advertising crab for a restaurant? Interesting sign though! 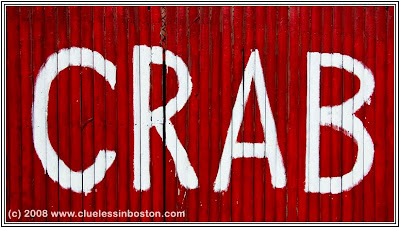 I love the Barking Crab! I was thinking about it the other day!! I have a pair of shell crackers from there. Just wanted you to know I stopped by. Happy Spring! I have an update on my blog about my surgery. Cool close-up - I like it! great that you couldn't resist! looks really cool, but really, any clue for what this sing was?